The Tipu tree is one of my favorite trees. 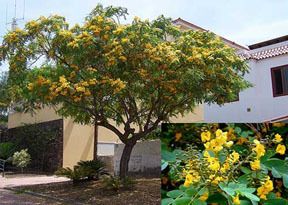 It is a quick growing umbrella like semi-evergreen tree with yellow flower in spring and fall. The Tipu tree is a fast grower that grows to 30 feet tall and about 25-30 feet wide. It is a very tropical looking tree but can handle our Arizona heat. The Tipu tree is hardy to 25 degree.